Attached to this post is the current in-progress draft of the cover for Tooth & Nail, the second Withrow book. It isn’t finished, and the fonts haven’t been chosen, but John Ward, my cover artist, has been working on the faces of Withrow and his insane cousin Roderick. It’s always fun to watch these develop. The eerie glow over the Blue Ridge Mountains in the background and that slight smile on Roderick are just owning me right now. In other awesome news, I’ve been invited to submit a short story to an anthology being compiled over the summer for release in September. The theme is “invasion” and we’re allowed any genre other than erotica. I spent a walk around the neighborhood with Pants Wilder bouncing some ideas around earlier this week and we came up with what seems like a pretty great idea for a short story. It’s about a vampire, of course, but not like any of the ones I’ve written so far. He will, however, show up in the third Withrow novel: Deal With the Devil. 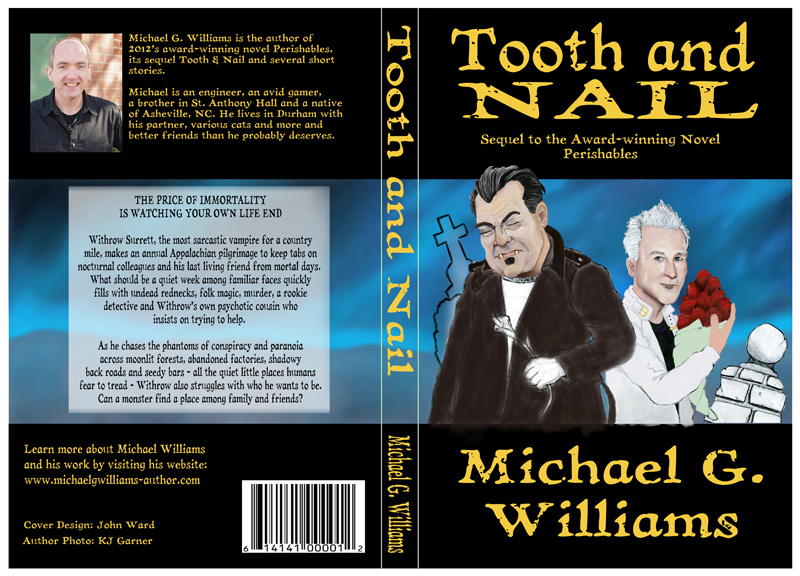 Otherwise, I’ve mostly been obsessing over CreateSpace formatting for Perishables and for Tooth & Nail. Ugh. Formatting. This is not what I love about writing – until all of a sudden it works and then I’m all yesssss. Formatting, it turns out, is kind of like a single-player videogame built into Word. Who knew?